Beat and I just returned to Reykjavik after a week of fun and scenic running across the highlands and along the southern coast of Iceland during the 2013 Racing the Planet Iceland event. With the exception of extremely crowded tents and resulting sleep deprivation, I loved every part of it and had a great experience. I plan to hammer out a race report with photos for my blog, but I thought I'd drop in a few gear and event notes before we return to California. • The course was about 154 miles overall according to my measurements. Day one was 29 miles, day two 28, day three 27, day four 25, day five 39, and day six 0 (rest day) and day seven was 6 miles. • My pace was surprisingly consistent, averaging right around 4 miles per hour every day. Running with the pack was tough and I felt I was wasting a lot of energy at anything higher than a 12-minute-mile, but I could walk efficiently and comfortably at 3.5 miles per hour. I tended to vary my movement between this and a 4.5-mile-per-hour shuffle. Speed was usually determined by the technicality of the terrain. There were relatively few long climbs and these always felt like rest breaks, because I walked them. Even downhill running was strenuous and challenging, which made it fun. • Final results aren't in yet, but of the 270 starters, about 228 finished all six stages. About 80 women started the race and about 64 finished. After stage five I was in 75th position overall and 13th woman. It's better than I expected to end up in this field, actually. It was a highly runnable course with plenty of fast runners. The "hikers" had no advantages, except for perhaps our consistent speed over long distances. I don't know my positions in each stage but I'm fairly certain my best showing was during the "Long March" 39-mile stage. • The weather was almost exactly what I expected, but the race officials kept commenting about how unseasonably bad it was. We had one day of sunshine and six days of clouds, four of those with varying levels of precipitation. Every day was windy, some with gusts I would estimate to be over 50 miles per hour. I was knocked off my feet once and pushed out of balance countless times. Temperatures ranged from 21 degrees overnight to daytime highs in the mid-50s. Windchills usually kept the air feeling quite brisk, and I'd say the "feels like" temperature was rarely above 40. • My favorite piece of gear was my DriDucks "astronaut suit," named as such by a fellow competitor from Cleveland because it was billowing and light gray with U.S.A. flag patches on the shoulders. The FroggToggs brand is cheap and ugly and amazingly effective at keeping wind and rain from driving in that bone-chilling cold that I remember all too well from my Juneau days. The material never feels wet, and its lack of breathability holds in a nice warm microclimate of body heat. The one drawback is that this clothing is not durable. 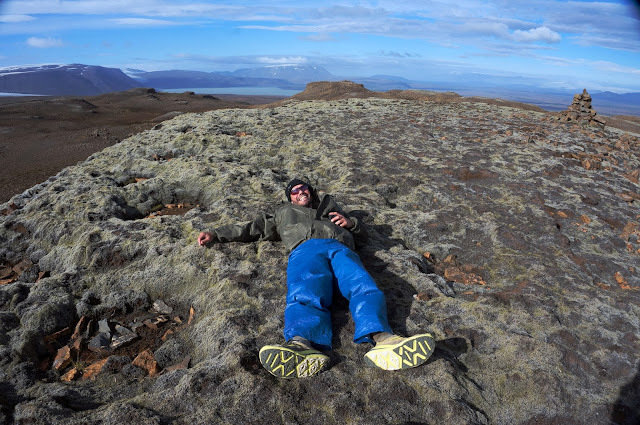 My jacket and pants are pretty tattered from the wind and lava rocks, and I don't think they'll be leaving Iceland. But I would certainly buy another set in the future. • My daily meals were bland and monotonous. Breakfast was always two packets of coffee, one serving of peanut butter, and one granola bar. Mid-day calories were two candy bars, one granola bar, and one five-ounce package of gummy candy. Post-run was a single serving of Pringles and a bullion cube dissolved in hot water, and dinner was one freeze-dried meal and one hot chocolate. I thought it was going to be awful to eat this way but it wasn't that bad. I was always grateful for whatever I put in my mouth when my "ration" time came around, and I didn't crave fresh fruits and vegetables as much as I thought I would. • I consumed 2,700 calories per day. This was slightly supplemented so it was probably a bit higher. Foods I picked up from fellow competitors during the race included one freeze-dried meal, one Honey Stinger waffle, two pieces of bread, two pieces of flat bread, and a chocolate bar. I gave away two servings of peanut butter, two granola bars, and finished the race with two candy bars and two granola bars. • This food intake was surprisingly adequate to stay warm, energetic, and happy for 6.5 days. 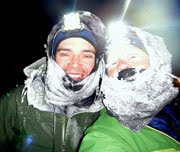 Ever since my four-day-long bonk during the 2008 Iditarod Trail Invitational, I have been terrified of the prospect of being underfed in cold-weather endurance efforts. There was no way I was going into this event with its 2,000-calorie-per-day minimum. I thought 2,700 would be a sacrifice, but in this carb-loaded, quick-energy format with a hot meal to end the day, it remained effective and satisfying over the course of the race, even while running for seven-plus hours each day. This makes me think I eat too much in my day-to-day life. • Before the race started, my pack weighed in at 12 kilograms (26.5 pounds) without my RidgeRest sleeping pad and without any water (but with the clothes I wore on my body at the start of the race.) Still, ouch. But after asking around I found out this number was fairly comparable to others with much smaller packs. • Our 50-liter GoLite Jam backpacks were among the largest in the field. The large majority of the group had 30-liter packs and the fast runners usually cram minimal stuff into 20-liter packs. I'm not swayed by minimalism for the sake of minimalism, and I was actually really happy with my pack. I watched my tentmates struggle to cram their stuff into their packs each morning while Beat and I could pack up in under five minutes flat. I had one spot of chaffing on my lower back after the single "warm" day, and only slight collar bone soreness. Except for suddenly gaining 30 pounds, it was as comfortable as wearing a small hydration pack. And it was fairly effective at holding off the elements, including rain, graupel, and sharp volcanic sand. • Iceland is so cool. I am a northerner at heart at felt at home in this stark, gloomy landscape. I'd love to return for a more intimate exploratory backpacking trip, with the solitude I feel this landscape merits. Someday. Okay, this is going long. Race report soon. Copy editing is important. See the review by Quercus of "Arctic Glass" for Kindle. Read your self-serving review and your need to link it here suitably ensures I won't be buying or recommending your book or reading anything you publish online. I will stick with Jill, who doesn't have to engage in passive aggressive cries for attention. Also, if you're going to call someone else out for errors, it would behoove you to know/understand that book titles are always written in italics, not between quotation marks. Love reading your blog Jill. Thanks so much for taking the time. Congratulations, Jill. I enjoyed watch you and Beat consistently move up through the field each day of the race. Anon — Fair points. For the record I do not copy-edit my own books or my own writing. I've found it's impossible; I tend to read over all the mistakes without recognizing them. I had one copy-editor for Arctic Glass. Clearly some issues were missed and I plan to address this on all of my Kindle books soon. I believe it's clear to readers that these books are self-published and have some of the imperfections that any independent projects are bound to have. Given a chance to do it over, I still wouldn't chose any other form of publishing, as the freedom not to mention the income of independent publishing is quite satisfactory. How cool to hike on top of the mid-Atlantic Ridge!